Ok, so I mentioned at the end of my last post that I would be having a comp/giveaway of this fabulous new book we have arriving this month. Well, I have managed to get my hands on another one so I now have two copies to giveaway! Yay! 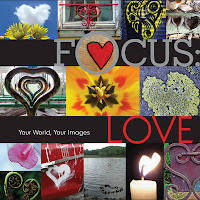 The first way you can go in the draw to win a copy of Focus: Love is to simply leave a comment in the comments section of any post mentioning the book - Wednesday's Wonderful Book of the Week - Focus:Love, Giveaway Post, Giveaway Summary . As always, there will be extra entries added for anyone who twitters about the giveaway (don't forget to let me know you've done this in the comments), becomes a follower of my blog or posts about this giveaway on their own blog. Anyone who posts their picture on their blog as an entry for Part Two will automatically recieve an entry in the giveaway for the other copy of the book. Make sense? The winner of the first copy will be drawn by using the complicated, scientific method of entering numbers into random.org, the random number (and winner) generator. Post the picture (or a link to the picture) on your blog, mentioning this comp/giveaway, and leave me a comment below with the link to your picture. If you don't have a blog, you can still leave me a link to your fav pic if it's somewhere on the net, or maybe post it to your facebook page, and once again, leave the link below in the comments section so I can check it out. So that's how you go in the running to win the second copy. Myself and the girls in my office will go through all the entries and pick our favourite one to be the winner. Does that all make sense? Not too hard? If you're not sure what I'm on about, send me an email with your questions. All entries and comments for both parts of the giveaway must be submitted by next Tuesday 9th February at 11:59pm (Australian Eastern Daylight Savings Time) and winners will be announced the following day (10.02.10) at 12pm (AEDST). This giveaway is open to anyone, not just people in Australia, however I will be endeavouring to express post copies to the winners to arrive before Valentine's Day (hopefully!) so if you are OS and you win, I'm sorry but I won't be able to get it to you before V-Day. Sooo looking forward to your comments and seeing your fav heart pics! Get cracking and don't forget to tell your friends and family! Hi, if I email you the photo, can you add it for me? Love this book!